G. E. Bentley, Jr., writes about Blake and his contemporaries, particularly George Cumberland, John Flaxman, the Edwardses of Halifax, Thomas Macklin, and F. J. Du Roveray. His Penguin edition of Blake’s Selected Poems was published on 31 March 2006 (though dated 2005). C. S. Matheson teaches at the University of Windsor, and studies late eighteenth- and early nineteenth-century literature, aesthetic theory, and visual art. She is working on a book examining the invention of public art exhibition in Georgian England. Robert N. Essick is still cleaning his house, hoping to come upon more forgotten drawings. William Stevenson has taught at universities in three continents, but has now retired from the battlefront. He is presently engaged on the third, much revised edition of the Complete Annotated Poems of William Blake, to be published by Pearson later this year. David Betteridge (haze-bee@tiscali.co.uk), a teacher and teacher-trainer in Scotland, has been writing poems for nearly half a century, although publishing for less than ten. He learned to love Blake’s work (poetry, prose, and art), and to admire the stubborn, principled way he lived his life from childhood holidays spent listening to a revered old grandfather, who, like Blake, was himself both artisan and artist. More recently, he has learned further to appreciate the musicality of Blake’s use of language, and to recognize its richness of meaning (or meanings) from getting to know an inspired setting of Songs of Innocence made by a friend, the composer Ronald Stevenson. The Marriage of Heaven and Hell remains a favorite book, unrivaled in its marriage of form and content since its inruption into English literature. MANUSCRIPTS are welcome in either hard copy or electronic form. Send two copies, typed and documented according to forms suggested in the MLA Style Manual, and with pages numbered, to either of the editors. No articles will be returned unless accompanied by a stamped self-addressed envelope. For electronic submissions, you may send a diskette, or send your article as an attachment to an email message; please number the pages of electronic submissions. The preferred file format is RTF; other formats are usually acceptable. 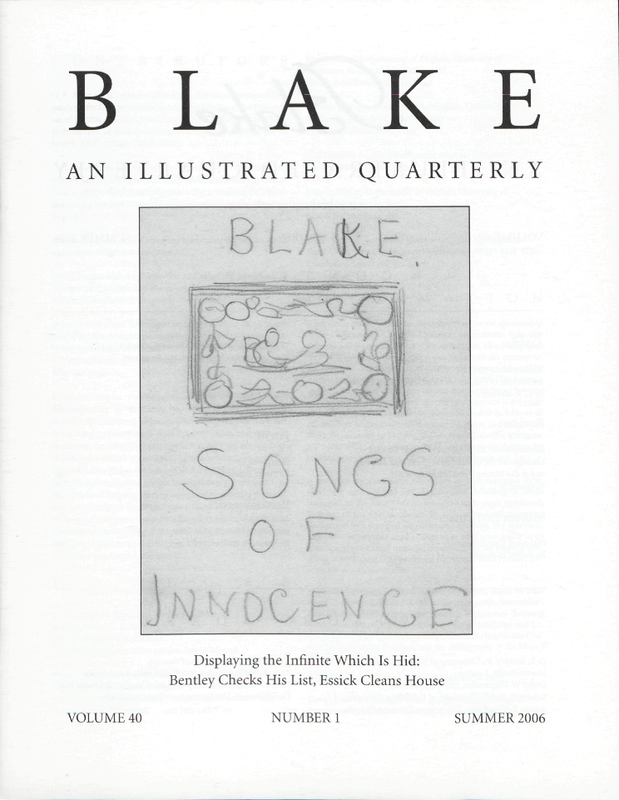 Cover: Kate Greenaway, A Cover Design for Blake’s Songs of Innocence. Collection of Robert N. Essick. See page 44.